Over the 4th of July, I attended a theatrical production of the history of my hometown of Mobridge, SD. The actors and actresses did a terrific job of illustrating the tough times of the early pioneers trying to forge a new life along the Missouri River in barren lands of northern South Dakota. What I found most interesting was that this production took place in a cemetery. They were giving us a glimpse of the legacy left behind by these brave and bold individuals against a backdrop of tombstones and gravesites. While we know very little about those who lived 100-200 years ago, people today have the ability to leave a very detailed, well-documented legacy. In fact, they have the ability to control their reputation long after they die. Emerging from the midst of our massive information revolution is a fascinating new industry – legacy management. And one of the critical decisions each of us will have to make is whether we want to manage our legacy virtually or have it tied to a specific location. Preserving your precious life moments. Our ability to capture snippets of our lives and preserve them has been growing exponentially over the past few decades. Posting documents, photos, videos, voice recordings, and other details of our lives onto the likes of Facebook, Youtube, LinkedIn, Twitter, and Google+ has never been easier. The number of “legacy-building tools” is growing quickly. But at the same time, we have no good understanding of whether these tools will still exist even 10 years in the future. How much of what is being captured today will still be around 500 to 1,000 years from now? In 1999 some of the top Internet properties were Lycos, Xoom, Excite, AltaVista, and GeoCities. Each of them were attracting millions of web visitors each month, competing head to head with companies like Microsoft, Yahoo, and Amazon. Today each exists in name only, resting quietly in a shadow of its former existence. It’s difficult for us to think this far out when our technology is changing so quickly. Will companies like Facebook, Google, LinkedIn, and Twitter still be around 100 years from now? Probably not. More importantly, if companies like this disappear, what happens to all the information they collected? Organic growth often leads to organic abandonment. Is the speed with which they arrive a predictor of the speed with which they will leave? In the midst of all these questions lie the makings of an entire new industry, one near and dear to our own hearts – building and preserving our own legacies. As we look at the next generation of the Internet, watching carefully as it unfolds, we cannot help but be struck by how quickly it has infiltrated our lives and how much of our attention it currently commands. Much like the physical structures in our cities that form along the horizons of our urban landscapes, the data structures inside today’s data giants represent some of mankind’s most remarkable feats. True, they exist only as a digital compliment to the bricks and steel of physical buildings, but they hold within them vital clues about who we are, what we find valuable, and our drives and passions for forging ahead. Is this how all tombstones will look in the future? Walking through cemeteries, I marvel at the huge investment people have made in the granite tombstones that mark each grave. People are desperate to leave some small record of their existence. As we debate whether its better to leave a digital legacy or a physical one, many will still opt to buy cemetery plots as a permanent location to preserve our passing. Using 3D printer technology, people in the future will be able to create a physical sculpture of themselves, life-size or larger, for not much money. At the same time, we will be improving technology for producing digitally engraved portraits, documents, and other records in the likes of granite and marble. Since we don’t have confidence in our ability to leave a long-term digital legacy, many will resort to leaving a physical one. If, for example, over the next 100 years a total of 10 billion people decided to preserve their legacy, each leaving a total of 10 cubic yards of physical material, the resulting collections would take up a land area slightly smaller than the state of Ohio, and would be filled with countless immovable objects that communities would have to build around. Is that a likely future? Virtually everyone wants to leave something behind. Regardless of whether it’s a simple photo, a message for our great, great grandchildren, or the lessons we learned along the way, our ability to make our mark on the future is limited by our tools of preservation. As we think through the future of information, there are three foundational pieces that will help us build this industry – finding the End of Moore’s Law, the Whole Earth Genealogy Project, and Creating a Digital Preservation Culture. 1.) The End of Moore’s Law – Before we can set standards for long-term data storage, we will need to find the ultimate small storage particle. 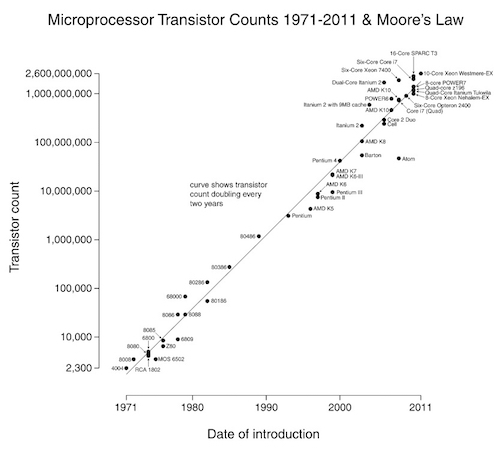 Based on this piece of Moore’s Law research conducted by University of Colorado’s Professor Mark Dubin, we still have 131 years before we are able to store information on an individual electron. However, that date will likely happen much quicker with some of the latest advancements in nanotechnology. If we were able to see a database of humanity’s DNA, what patterns would emerge? 2.) Whole Earth Genealogy Project – The genealogical industry currently exists as a million fragmented efforts happening simultaneously. While the dominant players, Ancestry.com and MyHeritage.com, have multiple websites with hundreds of millions of genealogies, there is still a much bigger opportunity waiting to happen. More importantly, it will become a new organizing system for humanity – a new taxonomy. Every person on earth will have a placeholder showing exactly where they fit. In many respects, it will be similar to the way maps helped us frame our thinking about world geography. This would be a new form of “geography” for humanity. Most of the digital and analog information from only 20 years ago is unreadable with the tools and technologies we have today. Cassettes, 8-tracks, and even 3.5” disks are all becoming museum pieces as the tech world has left them as little more than a fading memory in its own digital exhaust. One of the prized assets of today’s Internet companies is their ability to amass huge volumes of digital information. But we have no provisions for preserving the data if the company itself goes under. While governments around the world have worked hard to create a monetary system with central banks to step in whenever a currency is failing, we have no “central information banks” that can step in when an information company is failing. How will future generation remember you? How will they perceive your successes and failures, your accomplishments and misguided efforts, your generosity and perseverance? While many still view inheritance as the primary way to leave a legacy, people now have the ability to manage, and even micro-manage, the information trail they leave behind. In fact, if they choose to, they can even communicate with their own descendants, future generations who have not even been born yet. The body of work we leave behind has become increasingly easy to preserve. So if we chose to let future generations know who we are and why we set out to achieve the things we did, we can do that with photos, videos, and online documents. Stepping one step further into the future, generations to come will have the ability to preserve the essence of their personality and work with interactive avatars capable of speaking directly to the issues future generations will want to ask. The digital world, even as it exists today, contains the keys to humanity, the raw essence of personhood, and in the long run, the future of our children’s children. As all of us age, the notion of leaving a legacy becomes critically important, and furthering our abilities in this area will become increasingly important. In fact, it is on the verge becoming a fast-growing industry that many of us will want to work in.